Fake News is a new project, by Tim Knight, which uses Local and Family History’s newspaper archive to publish a fictional front page every month. Curated from cuttings of The Yorkshire Post and The Yorkshire Evening Post—Leeds’ oldest continuous newspaper—Fake News will explore the goings-on, mishaps and miscellany of Yorkshire through the ages. 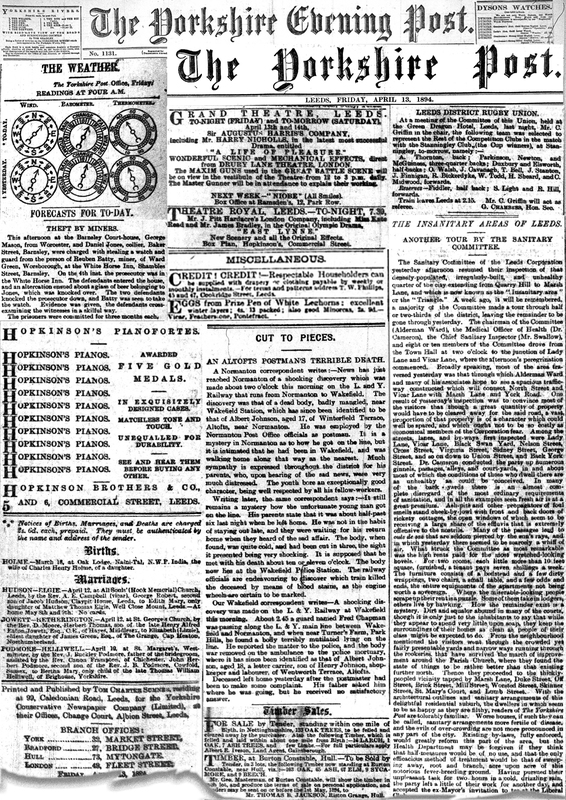 Today’s edition, hot off the press: 13th April 1894. Remember to swing by Leeds Grand Theatre between 12 and 3 to marvel at Maxim’s new machine gun, and avoid any possibility of a court appearance by keeping all pints of beer upright. Be sure to keep back 4s incase you wish to buy yourself some prize pen eggs from Pontefract.